A woman in a light-blue chadri abandons her infant in the backseat of a cab in the bustling streets of post-war Kabul. This is a deeper film than it first appears, examining cultural expectations of marriage - expectations that often conflict with the actual hopes of husbands and wives. Sure, it is funny and moves quickly, without lingering too long on any one scene or story line. The pacing and snappy dialogue give the film a light, whimsical feel. 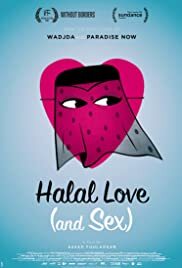 But it cleverly draws us deep into the private lives of each couple and their various hopes and challenges, revealing variously - love, loss, frustration and the right way to make tabbouleh. Darine Hamze, Zeinab Hind Khadra and Mirna Moukarzel are outstanding as the women in search of happiness with their hapless men (ably played by Rodrigue Sleiman, Hussein Mokadem and Ali Sammoury). Don't be late or you'll miss the funny and awkward first scene in which a teacher valiantly tries to explain to her young students how babies are made - only to leave them more confused and afraid of... well, you'll see.